Get on the road to cycle around South Africa! 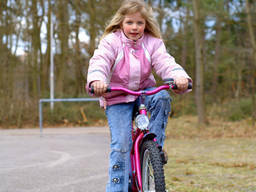 Cycling is a fun activity that both boys and girls can participate in. In South Africa there are many ways kids can get involved in cycling both competitively and for leisure. All have different rules, equipment and develop different physical strength (track cycling developing speed and muscular tonicity, mountain biking more endurance and agility) but are obviously the same original sport. Learning to ride a bike can take weeks or even months of practice. But one nonprofit group is offering a class that uses an unusual method to teach kids to ride ... in as little as 15 minutes. Cycling is one of the most popular kids’ activities in South Africa – it could be perfect for your kids! Kids can compete in cycling events and competitions from the age of five or younger depending on the type of cycling it is. Biker clubs provide coaching for children and adults. You may want to seek one in your area, by browsing through our Active Activities directory. a tight stretchy outfit for competing. Track cycling can be done all year round. Road racing usually runs from autumn till spring. When it gets wet, it can get really dangerous and slippery due to the thin wheels. Fees vary from around R35 to R50. Mountain biking can be done all year round. Many BMX clubs have Sprocket Rocket divisions for kids under the age of 8 that focus on developing their skills. To join they’ll need a 20 inch or 24 inch BMX bike, gloves, full face helmet, and closed toe shoes. Membership fees range from R75 to R100. While getting your kids to start a sport, you must always consider the risks that are inherent to this sport and make sure your kids understand them well.